Concierge Medicine: What Is It? What is a concierge medical practice? How is this different from a traditional medical office? The concept of concierge medicine began in 1996 when Dr. Howard Maron in Seattle, Washington decided to provide a much higher level of medical care to a much smaller group of patients. Instead of relying on fee-for-service regulated by insurance companies which would not have been financially viable, he asked the patients to pay a flat fee or retainer in exchange for personalized “highly attentive medicine” as he preferred to call it. Since then, this concept has begun to spread across the country as an alternative to the rushed service typically provided in most traditional offices. The types of care and services provided by the concierge practices vary considerably and the retainer fee usually correlates with the level of service and care provided, ranging anywhere from $100 per year to $20,000 or more per year. The traditional office practice is one in which the doctor tries to manage 2-3000 patients on average at a rate of about one patient every 10-15 minutes or more. The current insurance reimbursements require most primary care doctors to see a high volume of patients each day in order to make ends meet. Most doctors don’t like to deliver this type of care but they have no choice. It doesn’t help to raise their fees because the insurance companies won’t reimburse them for what they charge anyway. So the only thing they can do to survive is see a higher volume of patients. As a result, the large number of patients in a traditional practice makes it very difficult for the doctor, no matter how dedicated, to provide the kind of excellent personalized service that he or she would like to provide. That’s why the doctor always seems rushed, and that’s why it takes so long to get prescriptions refilled and why patients have to wait so long for everything. Compare this with a concierge practice, consisting of maybe 2-300 patients in which the doctor can spend as much time as needed to fully evaluate the patient’s problems. Doctors actually have time to listen to patients, take a detailed history and do an exam properly. There is also time to discuss preventive health care with each patient and to answer any questions that come up during the visit. Imagine not having to wait more than 24-48 hours to make an appointment and not having to wait for more than 5-10 minutes max in the waiting room. Imagine being able to have telephone access to your personal physician at any time, day or night, 24/7 without having to go through an answering service or an on-call nurse or doctor who doesn’t know you or has no access to your records. Imagine your personal physician making a house call if you’re too ill to come to the office, or following you in the hospital as your attending physician. Many of these offices also provide you with a copy of your own personalized health record so you can keep track of your progress. They can also offer comprehensive health evaluations, screening services, EKGs, audiometry, certain vaccinations and many other services that would cost extra in traditional offices. Some of the concierge offices also charge for each office visit for which they can receive a partial payment from the insurance company. Some practices like ours just incorporate the office charges as part of the total service for no additional charge other than the annual fee. That way our office can provide unlimited office visits for all our patients for no extra fee. Unfortunately, at this time, insurance companies will not pay for concierge services. Thus the fee has to be paid out of pocket. For most of these practices however, the fee is not unreasonable and usually amounts to what you would spend on a cable bill or for going out to a restaurant once a week or half of what you would spend for a car payment. Your insurance is used when any outside lab tests, Xrays or other tests are ordered. You will also need your insurance for visits to specialists or if you become hospitalized. So, should you join a concierge medical practice? In summary, what it comes down to is the question you have to ask yourself: How important is my health? If it’s high on the list of things that matter in your life - like job and family, and if you want to live your life to the fullest and minimize your risk of future illness as much as possible, and if you want to really sit down with your doctor and discuss things that are of vital importance to you without being rushed, this is the practice for you. 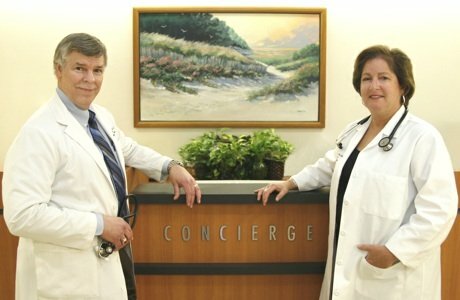 --Concierge Medicine - Is It For You? --Concierge Medicine - Just for the Wealthy? Contact Our Office 757-416-6750 Virginia Beach Premier Medical http://www.virginia-beach-premier-medical.com Copyright, 2009-2017. All rights reserved.